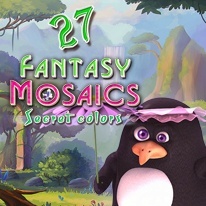 Enjoy colorful mosaic puzzles with a new gameplay twist! Penguin Penny was on her way to bring us new secret colors but she got stuck within a time portal! Help her find a key to the portal by solving mosaic puzzles with a new twist! Enjoy the new exciting challenges where you get to unlock secret colors while solving each puzzle! Explore the time portal and see what it's like!